The CR Clarke CR911 provides six thermoforming processes in a single machine. 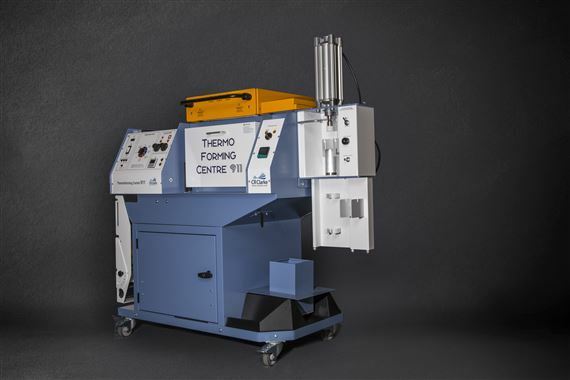 A two zone ceramic heater system ensures even heating for vacuum forming and also heats the fan circulated oven. A rotary switch allows the operator to select a process,while a digital timer with audible alarm provides a useful timing guide. Plates are supplied with the CR Clarke CR911 for two sheet sizes of vacuum forming, 305mm x 305mm and 305mm x 152mm. The maximum mold height is 100mm. Material heating is performed by the machine’s ceramic heater system, with two zones of heater control. A cast acrylic or PVC sheet is heated in the oven. It is transferred to the Dome Blowing plate, clamped, and compressed air applied beneath it. This forms the material into an even hemisphere. The machine is supplied with rings for 305, 225 and 150mm (12, 9 & 6”) diameter domes. A 5 liter tank containing thermoplastic powder is loaded into the machine. Compressed air is forced through the powder to aerate it, making it behave like a fluid. The metal item to be coated is heated in the oven and then dipped in the fluidised powder. The powder sticks to the hot metal. Once the item is removed from the tank the powder flows to form a smooth coating. An industrial hot air torch is integrated into the machine for the welding of solvent resistant materials (e.g.polypropylene). A fold up work-table gives support for materials being welded along with a calibrated tilting stop for setting angles. The injection molding unit is pneumatically powered by the machine’s vacuum/pressure pump. Material is heated in the oven in a high thermal mass aluminum pot. This pot is transferred to the injection molding unit and injected into a suitable mold by the pneumatic cylinder. The machine comes complete with two molds. Extrusion is also carried out on the Injection Molding unit,with the heated material being extruded through an I-Section nozzle into a cooling water tube. Fan circulated oven with digital display temperature control, provides the functions for plastic memory demonstrations, sheet heating, annealing etc.